This is the second press release, following the first one of January 7. See Japanese version HERE. 日本語版はここです。See below for media reports. Initial signatories included linguist Noam Chomsky, academy award winning film makers Oliver Stone and Michael Moore, Nobel Laureate Mairead Maguire, historian John Dower, former U.S. military officer and diplomat Ann Wright, and United Nations Special Rapporteur for Palestine Richard Falk. We now have over one hundred signatories, including the pioneer of peace studies Johan Galtung, physician and anti-nuclear activist Helen Caldicott, biologist and science broadcaster David Suzuki, peace educator Betty Reardon, political scientist Karel van Wolferen, and Pulitzer-prize winning historian Martin Sherwin. Other signers are leading authors, scholars, and filmmakers, representatives of various peace organizations, and citizens who have been committed to ending military colonization of Okinawa. January 19 marked a triumphant moment for Okinawa when residents of Nago City re-elected Mayor Susumu Inamine, who has consistently opposed the base construction “on land or on sea.” According to a pre-election poll, only 9 percent of Nago residents supported the new base plan. The rejection of the new base by a majority of the residents represented a vote of no-confidence in Governor Hirokazu Nakaima, who supported the pro-base candidate, and in Prime Minister Shinzo Abe, who pressured Nakaima to go along with the U.S. relocation plan. And as the New York Times rightly said, Mayor Inamine’s win dealt “an embarrassing blow to Prime Minister Shinzo Abe,” who attempted to buy votes with talk of more subsidies and public works projects. In the electoral history of Okinawa, no candidate has ever won by actively supporting a new base. The last Nago election was no exception. Citizens of Okinawa have filed a lawsuit to nullify Governor Nakaima’s approval of the massive land reclamation needed to build the base. They are seeking a way to recall the governor. The prefectural assembly passed a resolution to demand Nakaima’s resignation. The Abe and Obama governments, however, appear to be preparing to crush all resistance in Okinawa. Only two days after Mayor Inamine’s re-election, the Japanese government started soliciting bids for preliminary work on the base construction. Okinawans will continue to protest, as they have in the past, in the ways of demonstrations, petitions, elections, lawsuits, sit-ins, academic and artistic activities, and direct actions to stop construction. On occasion they have paddled canoes and tied themselves to scaffolding towers to successfully obstruct a government survey of the ocean. We support them in their ongoing struggle for peace, dignity, human rights, and protection of the environment. 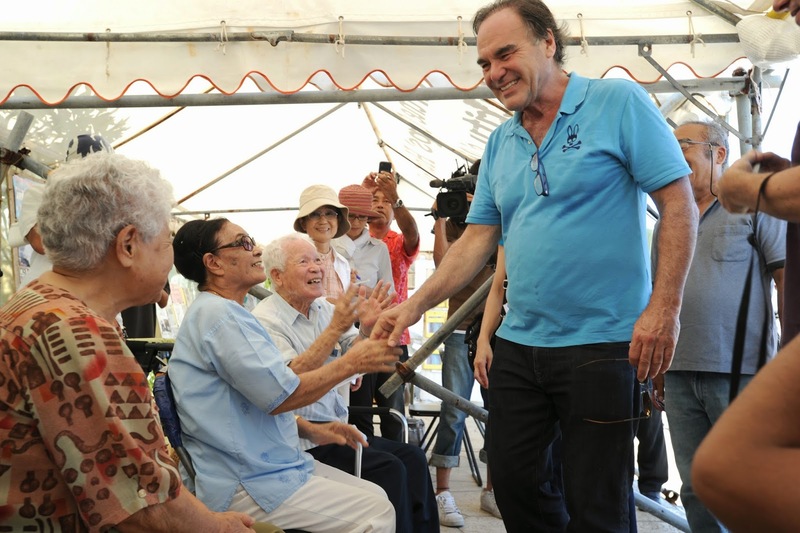 We are now launching a petition drive calling for international opposition to new base construction in Okinawa and immediate return of Futenma and challenging Abe and Obama’s contempt for the democratic and human rights of the people of Okinawa. The URL for the on-line petition is http://chn.ge/1ecQPUJ. The Japanese language version is http://chn.ge/1glVJSw. Governor Nakaima’s reclamation approval does not reflect the popular will of the people of Okinawa. Immediately before the gubernatorial election of 2010, Mr. Nakaima, who had previously accepted the new base construction plan, changed his position and called for relocation of the Futenma base outside the prefecture. He won the election by defeating a candidate who had consistently opposed the new base. Polls in recent years have shown that 70 to 90 percent of the people of Okinawa opposed the Henoko base plan. The poll conducted immediately after Nakaima’s recent reclamation approval showed that 72.4 percent of the people of Okinawa saw the governor’s decision as a “breach of his election pledge.” The reclamation approval was a betrayal of the people of Okinawa. Kate Hudson(PhD), General Secretary, Campaign for Nuclear Disarmament. Vanessa Warheit, Filmmaker, director of "Insular Empire: America in the Marianas"